ABSTRACT The osseous elements of the foot and ankle are described and illustrated in detail for the Hispaniolan solenodon, Solenodon paradoxus Brandt, 1833, one of two extant species of the lipotyphlan family Solenodontidae. Comparisons are made with the same elements in representatives of the three remaining extant families of lipotyphlans, the soricid Crocidura luna Dollman, 1910, the talpid Parascalops breweri (Bachman, 1842), and the erinaceid Erinaceus europaeus Linnaeus, 1758. The muscles attaching to the osseous elements of the foot in lipotyphlans are summarized based on the literature. The solenodon foot is generalized but with a unique modification regarding the entocuneiform: it has an elongate medial spur with a sizeable facet for the astragalar head. The other lipotyphlans studied have a medial spur of the entocuneiform, but it is well separated from the astragalus by the navicular. 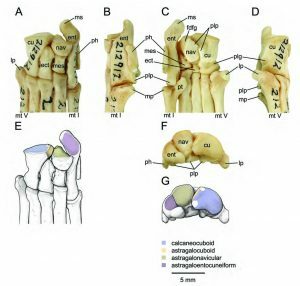 Crocidura luna also has a remarkable modification; the ectal facets on the astragalus and calcaneus have opposing concavoconvex surfaces. Measurements of all osseous elements of the foot were collected in the four lipotyphlans studied here. Various indices, the vast majority of which were taken from the literature, were calculated from these measurements. Metrical data were combined with those from prior studies that included relevant pedal measurements of lipotyphlans and some clades outside of Lipotyphla. Two Principal Components Analyses were performed to illustrate our data with regard to those of prior studies.